Supporting Causeway | Causeway Interfaith Volunteer Caregivers, Inc.
Causeway has fundraised for its budget since 1986. The fundraising efforts strive to not only raise money to sustain the mission but also to participate in community events, provide for Causeway’s future and educate the public on the needs the elderly, adults with disabilities and adults diagnosed with cancer face in La Crosse County and to provide for Causeway’s future. 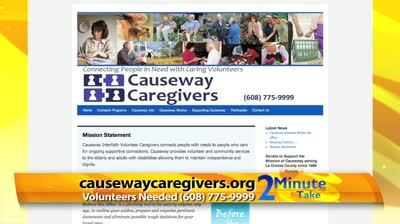 Causeway is not a federally funded volunteer program. Causeway is able to receive payment for volunteer services provided in a year from the La Crosse County Aging Unit. The services permitted are those that assist an individual over the age of 60 remain in their home. The services Causeway receive payment for is light housekeeping, errands, respite, bookwork / bill paying assistance, laundry, home repairs and grocery shopping. Outreach Programs are an integral part of the Causeway mission. Offering Community based outreach programs that are enjoyable and keep our matches active in our community are important addition to the home based services we offer. Arts Buddy and Sports Buddy are programs, where volunteers and matches attend live events in our area. Our Before the After outreach holds quarterly planning sessions based around reflective worksheets and state residency forms to assist anyone, any age of any means to plan their final wishes and organize final documents into one place. Other Outreach ideas in development are education based classes offering classes or topics that pertain to the recipients we serve and applicable to the services offered in our area. Class topic ideas are Basic Internet, Email, Facebook, Skype, Life Transitions, Aging Issues, Caregiver Support and Prescription Services. With Causeway being located in St. Paul’s Lutheran Church we have access to a computer lab for 6 individuals, large meeting spaces, webinar capable theatre and a central location with easy accessibility and handicap/mobility issue adaptations. 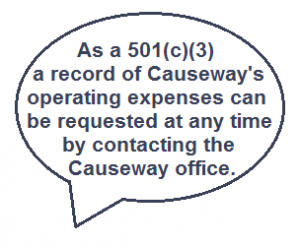 Causeway gratefully accepts cash, check or money order donations mailed or dropped at our office. Credit cards and utilizing your PayPal account are available on this website by clicking on the DONATE button. Donations made In Honor of or In Memory of someone are personally inscribed on gold and silver ornaments which adorn our annual Rotary Lights tree. All donations receive a thank you containing your donation information and is mailed or electronically sent to you based on your specification. Causeway Interfaith Volunteers, Inc. is a 501(c)(3) non-profit organization. Donations are tax deductible for federal income tax purposes as charitable contributions. Causeway is a mission that has simple roots, lives within its means and knows the importance of being wise stewards of what is entrusted to us.